"Invaluable new insights--not only with respect to Hosea as a man and as a thinker, but also in helping us understand the book that bears Hosea's name. As with his many other wonderful books, Dr. Drazin offers original interpretations while sharing his vast knowledge and deep understanding of the history and literary background of the Bible and its intriguing figures. Highly recommended!" The Columbia Review. Repentance – as the primary vehicle for restoring one’s standing in divine grace – has become the central tenet of Judaism, Christianity, Islam and their respective sub-denominations, but few remember today that Talmud gives the prophet Hosea credit for developing this fundamental idea of repentance. In that sense, Hosea serves as an under-appreciated forefather for countless religious philosophers and theologians, while his ideas continue to drive the way most of humanity worships God today in churches, mosques and synagogues. 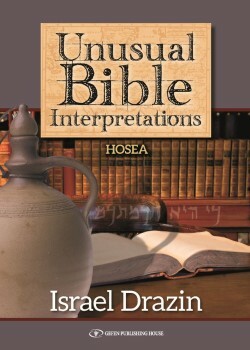 With this in mind, Dr. Israel Drazin’s new book, “Unusual Bible Interpretations: Hosea,” offers invaluable new insights–not only with respect to Hosea as a man and as a thinker, but also in helping us understand the book that bears Hosea’s name. As with his many other wonderful books, Dr. Drazin offers original interpretations while sharing his vast knowledge and deep understanding of the history and literary background of the Bible and its intriguing figures. Highly recommended!